Yusaf Mack Defeats Omar Sheika in War in AC! After the first round of their vacant USBA light heavyweight title bout Yusaf Mack, 30-4-2 (17), of Philadelphia decided to not move around but stand in there with Omar Sheika, 32-12 (21), of Paterson, NJ, the rest of the way. “I knew I could avoid most of his punches inside so from the second round on that was how I beat him. 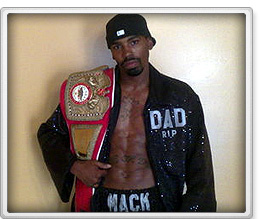 It’s my third time winning the USBA belt,” said Mack. He has won the super middleweight and light heavyweight USBA titles twice each. It looked like a packed house at the Starlight Ballroom at Resorts Casino and Hotel in Atlantic City, NJ, Friday night, co-promoted by Nedal Abuhumoud of Nedal Promotions, Andre Kut of KEA Boxing and Resorts. Many said Mack failed whenever he “stepped up” and that Sheika’s body attack would wear him down for a late stoppage. Mack proved all the critics wrong in putting on one of his best performances of his career. He had the backing of many in the crowd. His trainers Buster Custus and Rob “Bam Bam” Hines did well to get him in top shape. “I want to thank Dhafir Smith and Garrett Wilson for sparring with me,” said Mack. Sheika is the kind of warrior that could have fought in the 50’s and still become a contender. His heart is second to none. One mistake he made was still going to the body of Mack in the final 2 rounds instead of realizing it would take a knockout to win by then. Mack used a double jab and movement on Sheika in the first round and it seemed the crowd was going to be disappointed with Mack’s style. That all changed in the second round when Mack stayed inside and started landing right uppercuts that could have surpassed 50 by the end of the night. Sheika had no answer for that punch. In the third round both fighters opened up and exchanged numerous combinations. It was the beginning of what would be a memorable fight for the many fans in attendance. They got more than their monies worth. Sheika got warned several times by referee Brian O’Melia for infractions. It seemed more like frustration than anything else. Sheika would come in with his head and Mack would use his left elbow to deflect it. By the seventh round with the fight well in hand Mack started to slow down a bit. Mack would also control the eighth round until about 15 seconds to go when a Sheika overhand right drove Mack back. He seemed hurt for the first time in the fight. Mack again would control things in the ninth round until halfway through when a vicious left hook rocked Mack. He hit Sheika time and time again throughout the fight with power shots but Sheika just seemed to absorb them and keep coming forward. By the tenth round Sheika had a cut at the outside of his left eye brow. In the eleventh Sheika looked all done in. In the twelfth and final round Mack’s elbow opened up Sheika’s already cut left eye when the referee stepped in. It seemed to set Sheika off as he went on the attack only to find himself receiving a left hook than put him down. With about 15 seconds to go one of Sheika’s corner men was trying to stop the fight. It would have been a cruel thing for Sheika to have received the kind of punishment he did and keep coming back to stop the fight that late in the contest though he seemed out on his feet at the time. Ring announcer Larry Tornambe did his usual fine job but didn’t mention the names of the judge’s when giving out the scores. He would later tell the press he was not given the names to announce, only the scores of 119-107 and 118-109 twice. On the dhb scorecard Sheika lost 120-107 but was in the fight and dangerous to the end. Mack proclaimed after receiving the win “I want a rematch with Tavoris Cloud the IBF champion whom he lost to in 8 rounds last September while behind on 2 of the 3 score cards. Mack is ranked No. 11 in the IBF. The Co-Main Event featured prospect Derrick “Take it to the Bank” Webster, 13-0 (7), of Glassboro, NJ, and Sabou Ballogou, 8-5 (3), of Togo, living in France. Both fighters are southpaws in the super middleweight division. Webster proved superior with a height and reach advantage sticking and moving on the flat footed Ballogou for the first 6 rounds of this scheduled 8 round bout. Ballogous had received a cut on the outside of his right eye in the sixth round. Suddenly in the seventh round an overhand right dropped Webster to the shock of the fans. Referee Lindsay Page started counting and Webster barely beat the 10 count. The fans seemed upset when Page took too long to see what the condition of Webster was. Webster was badly hurt and another overhand right dropped him for the second time. Webster got up leaning against the corner of the ring. Referee Page got to 8 and never asked the weary Webster to take a few steps forward. He was able to get through the round. In the eighth round Webster’s head was clear and he was out for revenge and wanted to punish Ballogou. He continued to talk to him while administering a beating to his opponent. In the eighth and final round Ballogou was moving backwards trying to avoid a punch when he seemed to trip into the ropes without being hit by a punch. Referee Page started to give him a count as the bell sounded ending the round and the fight. Suddenly after getting to 8 Page waved the fighters to continue before he was informed the fight was over. All 3 judges, Eugene Grant, Lawrence Lathan and George Hill had it 77-72 for Webster as did dhb. It should be a lesson well learned by Webster to keep your hands up at all times. In the knockout of the night southpaw Juan “The Beast” Rodriguez, 9-0 (4), of Union City, NJ, knocked out over matched Daniel Crabtree, 3-5 (3), Hilliard, OH, in 1:59 of the second round with a straight left on the chin. Crabtree was coming off a third round stoppage by Thomas Lamanna who was on the under card of the show, in February. Referee Page wisely waved the fight off when Crabtree hit the canvas. Lamanna, 8-0 (5), of Millville, NJ, easily defeated over matched Sean “Hollywood” Wilson, 5-10 (1), of La Vista, NE, over 6 rounds using his reach and height to advantage almost landing the jab at will. He has a big following won on all score cards 60-54. Page was the referee. In a good bout Wilkins Santiago, 5-1 (1), of Lorain, OH, started slow in losing the first 2 rounds but came back in the third and dropped Alando Swain, 5-2 (1), of Trenton, NJ, in the third round and going on to win a 6 round decision in this middleweight bout by scores of 58-55 twice and 57-56. Dhb (DoghouseBoxing) had it 58-55. The referee was Alan Higgins. In a good bout Anthony “Juice” Young, 4-0 (22), of Atlantic City, won a hard fought 4 round decision over Jose “Baby Boy” Calderon, 4-2 (4), of Puerto Rico in this welterweight bout by 38-36 on all score cards. Page was the referee. Young seemed to win all but the third round while receiving a cut on the outside of the left eye in the fourth and final round. David Roman, 3-0 (1), of Paterson, NJ, defeated Dominique Foster, 0-1-1 (0), of Hilliard, OH, over 4 tough rounds by scores of 40-36 (2 times), and 39-37. The referee of this light middleweight match was Huggins. In the show opener Albanian Stivens “Superman” Bujaj, 5-1 (5), of New York City, stopped Ecuador’s Livin Castillo, 16-13 (10), now out of Atlantic City, at 1:53 of the fifth round of a scheduled 6 in the cruiserweight division. Page was the referee .